The medal is made out of the St. George red stone. 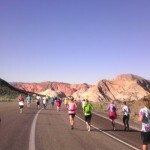 Solidifying my reputation as a marathoner I ran my second full marathon in St. George, Utah. It was definitely an interesting race. 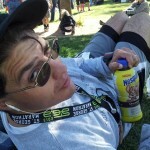 I am not much lighter than was last year. In fact i still qualified for the 200+ lbs. category. Still, I am not the same person I was a year ago. I am a lot stronger now than I was a year ago in my last marathon. On numbers alone this shows. 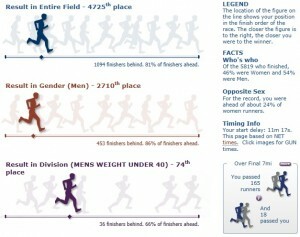 Last year I finished in 5 hrs., 23 mins., and 23 seconds. 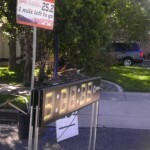 This year my official time was 5 hrs., 1 min., 11 seconds. My pace has improved on the marathon by a whole minute. It might now seem that much to a non-runner. but ask anyone who has run distances and they will tell you that shaving a minute off your pace time is a big deal. It really adds up over 26.2 miles. It was really cold at the beginning of the race. I was first!! On the first bus… The beginning of the race can be summed up into one word: cold! I have been training all summer long. My training had consisted of really early running, and even though it was what I would call brisk on some days, I was not ready for the Utah morning air. I figured it was going to be a little cold so I brought a long sleeve shirt. The plan was to put it in my retrieval bag and pick it up after the race. I was not very organized in this aspect. Luckily, the race was very organized and they were more prepared than I was. As soon as I got off the bus they handed me a pair of running gloves, a running blanket, a banana, and a cup of hot chocolate. It was nice except for the fact that I was so cold that I kept spilling my hot chocolate as I was shivering. 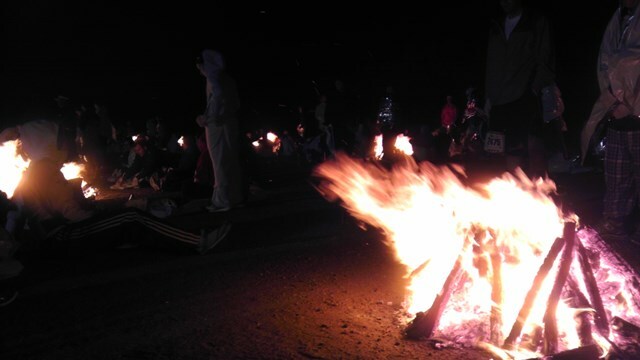 The race organizers were also very kind enough to have several fires going. 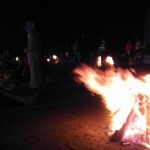 I think there was a raffle for those who arrived early but I was so cold I didn’t really move much from the fires. They timed the fires out pretty much perfectly so that when the last campfire went out when it was time to start the race. I was really happy to see the dawn. It was cold. The first part of the race was pretty much in the dark. The first mile was a slight uphill, but the next seven miles were a gentle downhill. Overall, it was really pleasant. 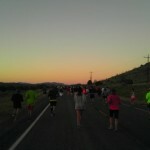 As the I ran the first 10k and the sun slowly run I was reminded of my weekly runs. For the last 6 months I have been consistently running 5 miles every other day. As a consequence I went very fast on the first few miles. 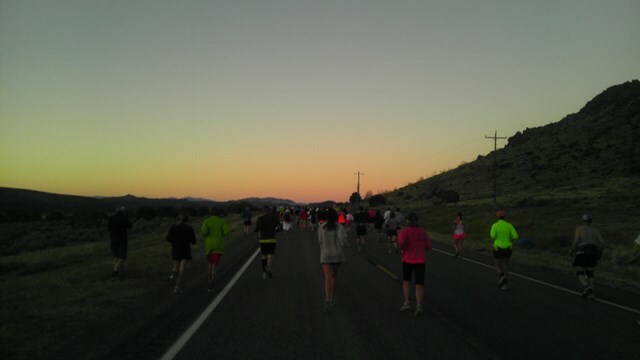 Probably too fast, but it was ok because as the sun rose my stomach also woke up. I ended up having to make three potty stops. 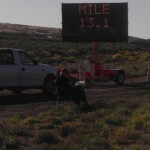 There were porta potties at each mile but they were always occupied and so it took a bit of time stopping. Some people went off track into the forest, but considering all that land is privately owned I didn’t think that was very considerate. 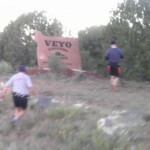 Veyo is a town I will remember for a long time as being the town I climbed for 4 miles. When I rode up on the bus I spoke to a guy who had run the course previously. It was very dark when we rode up on the bus, but I remember at about the half way point I could see a lit up chapel. That was pointed out to me to be the end of the incline. The beginning of the incline was a very small conical extinct volcano. Hitting the incline after such a steep drop was a bit of a shock, but at mile 7 it was still relatively at the begining of the race so it was good in that I had a lot of energy. Initially there is about 2 miles worth of incline going up past the first volcano. After that there were approximately another 2 and half miles of what I would describe as rolling hills. I am not a very big fan of rolling hills. 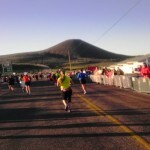 I picked the St. George because I thought it was a downhill race (which it is) and I was going to avoid rolling hills. It was overall a downhill race, but I definately did not avoid rolling hills. The town of Veyo was very supportive. I think the entire town came out to see the race. The town of Veyo is very small, I don’t know the exact population but I can’t imagine it being that big. 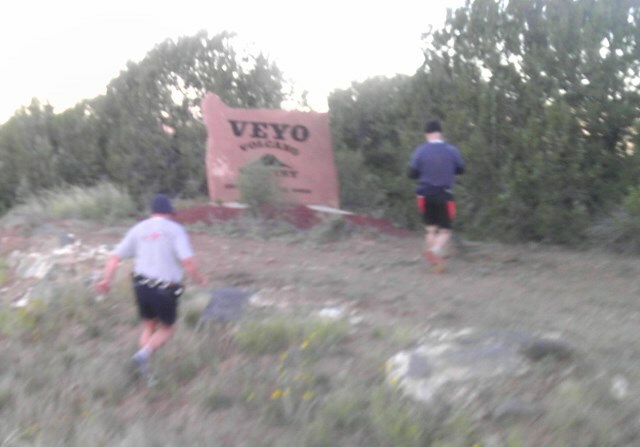 Despite it’s small size and it not very fun incline I have to hand it to the town of Veyo for uplifting my spirits. Since most of the race is on a solitary road there were not many spectators during the race, but as soon as we reached Veyo it was obvious the whole town comes out for this event. 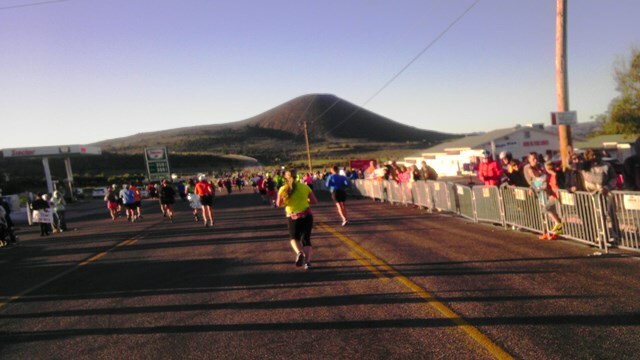 I was pacing a 5 hour race, so I was obviously in the back half of the race, but the people were still there. They had music blaring, adults were ringing bells, kids were giving out high-fives, and a little old lady held out a chocolate chip cookie for me. It was great. I really feel that it was the people of the town of Veyo that helped me get up those inclines. At the half way point their was this guy in a chair asking everyone if we wanted to quit. It was kind of weird. At the half way mark it was a bit strange. 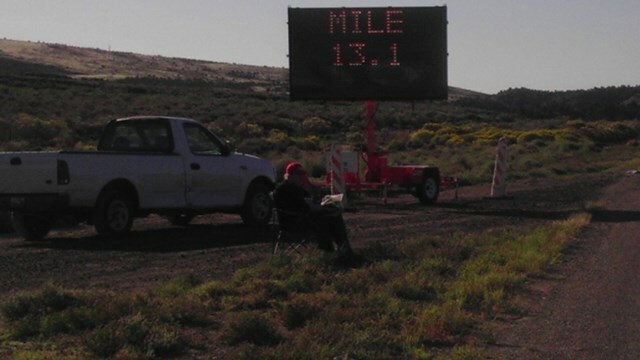 There was a big sign that said “13.1 miles. Are you strong?” and there was this guy in a fold up chair asking the runners if they wanted to quit. I appreciated the concern and the reasoning for him being there, but it was still a bit of strang sight. Running past the guy in the fold up chair we soon came up to Diamond Valley. Coming around the corner and seeing White Rocks was awesome. Diamond Valley was a welcome sight to me. I knew from my research that Diamond Valley was the end to all inclines. What I wasn’t prepared for in my research was the view of White Rocks. It was breathtaking. I saw that it has some hiking trails. I would love to come back one day and explore it further. From the summit of Diamond Valley to the entrance of St. George the scenary was spectacular. The first half of the race might have had some nice scenery as well, but I didn’t notice it as much. What I did notice was the magnificient rock formations. 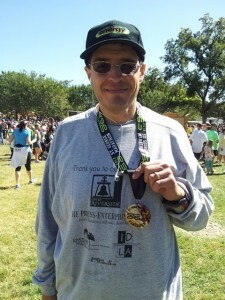 At mile 17 I started to hurt, but I was still well on track to finish in under 5 hrs. At mile 20 my muscles started to go into spasms and the 5 hr. pace group caught up to me. I struggled as much as I could but by mile 23 I had lot the 5 hr. pace group and I knew that I wasn’t going to be able to catch them again. It was hard to see them go, but I started this race on my own terms and I knew I was going to have to finish it on my own terms. I was well under the cut off time, but I was very happy to have passed this barrier. Anyone who has ran a marathon knows that the last six miles are brutal. 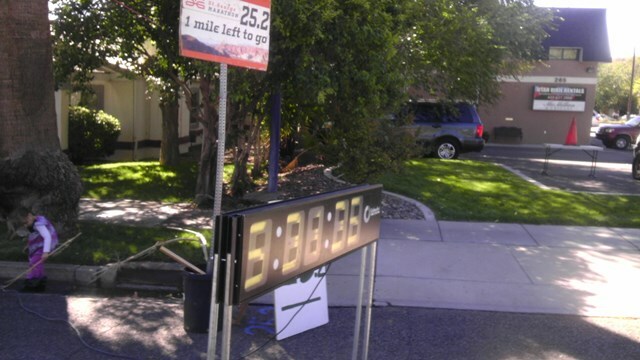 At mile 23 there is a cutoff point that if you don’t make it under 6 hrs. you are automatically cut off from the race. I reached that point in about 4 and a half hours. I was well under the cutoff time but it was still an emotional moment for me. I knew at that point I was going to finish the race, I didn’t know exactly at what time, but I knew I was finishing. It was tough but I kept moving. The end of the course was what I would describe as very winding. 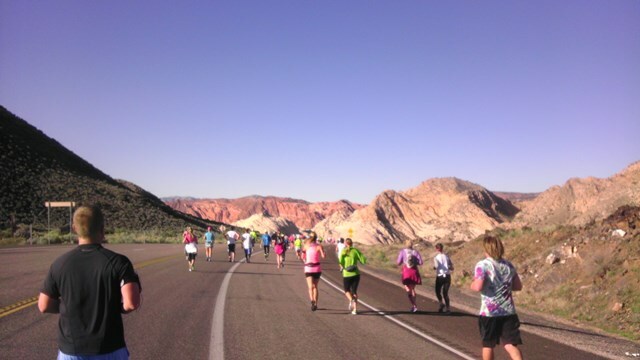 There were lots of twists and turns as we ran through the city of St. George. In the city of St. George there were a lot of spectators. I still say they didn’t meet the level of enthusiasm of Veyo, but it was still nice to see them. 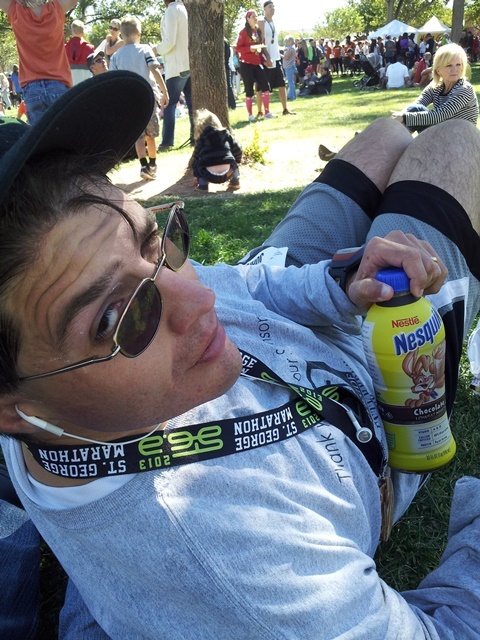 Chocolate milk is still my preferred drink after a race. I can feel it working almost immediately after a race. The end of the race was fun. 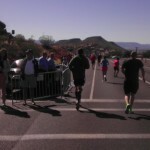 Once the pace group passed me, not many people were running close to me. According to I passed quite a few people. 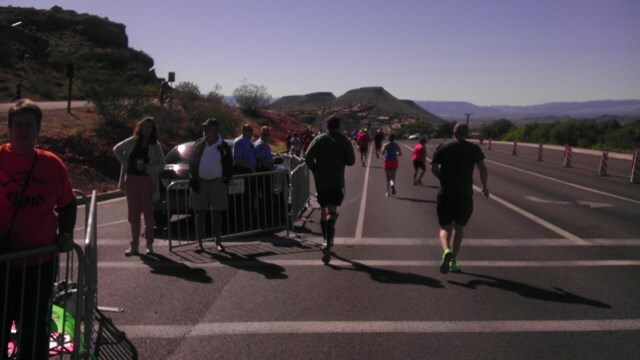 It was kind of sad to see so many people so close to the finish walking, but at least they were still moving. I particularly liked that at the finish line in addition to getting my medal they were giving the runners all the ice cream they could eat (I had two drumsticks, thank you Blue Bunny). I also really enjoyed that Denise was there with a big chocolate milk. I don’t know why it works, but almost immediately after a long run it helps bring down the swelling. Click here on this photo to see my stats in the race. As I pointed out in the quote there is isn’t a miracle that I finished. I say at mile 23 I knew I was going to finish the race, but really I knew I was going to finish a lot early. A year ago I had a belief that I was going to finish the race, but when I stepped up to that start line I realized not only did I have a belief in myself. I had faith in myself. Yes, I would have liked to have been under 5 hrs., maybe one day that will still be possible, but I am happy because I put my faith into action and now I know exactly what I can do. Once again I have taught myself what I can do, and what I can do is awesome. I gotta see if I can find me one of these shirts. Last week as I was running I saw a biker pass me up on one of my training runs (happens often on the Santa Ana River trail) and thought to myself I wonder how far I can go on bicycle. I once followed a blog of a family that traveled all the way from Alaska to Argentina on bicycles. I would love to take an epic trip like that with my family, but I don’t think they share with me that goal. So I then thought what would be a good personal goal to achieve and I wondered what it would be like to ride all the way from Riverside, CA to Huntington Beach, CA (where the Santa Ana River trail ends. It is about 50 miles out, so if I went out and back that would be about 100 miles. Apparently, unbeknownest to me that is already a “thing” in the cycling world. It is called a Century ride. So that is what my next year goal is going to be. I don’t know exactly when or how, but I know from my running experience it doesn’t really matter. Those things will come, right now I just need the courage to start. I really enjoyed reading all the details. One minute off your pace is incredible! I love the quote by John Bingham, it’s my new wallpaper on my phone 🙂 congratulations John! Can’t wait to read about your century ride! Awesome, John. You are an inspiration. Congratulations on your finish. You a are a real inspiration. It’s nice to connect with someone like you since we tend to encourage each other. I wish you well in your recovery, and in your daily training. Hopefully one day we can run a marathon together. Technically, we already did run a marathon together. Hopefully, we can do another one. I am still counting on you to show me that Hollywood sign trail.